메이플스토리 테스트 클라이언트 Ver. 1.1.439 릴리즈가 수정되었습니다. 1. 신규 지역인 ‘판테온’이 열렸습니다. - 판테온은 메이플 월드와는 다른 세계인 그란디스에 있는 노바족의 신전 마을입니다. - 카이저를 생성하면 판테온으로 진입하게 됩니다. - 판테온의 대신전 내부에 있는 ‘디멘션 게이트’를 통해 메이플 월드의 모든 마을로 이동하실 수 있습니다. - 메이플 월드에서 판테온으로 가려면 ‘여섯 갈래 길’에 추가된 ‘디멘션 게이트’을 이용해야 합니다. 1. 카이저의 스킬이 아래와 같이 조정되었습니다. - 각 공격 스킬의 일반사용/커맨드사용 시 모프 게이지가 차는 양이 조정되었습니다. - 트랜스 피규레이션(초보자) : 스탠스 확률이 조정되었습니다. - 드래곤 슬래시(1차) : 공격력이 조정되었습니다. - 스킨 프로텍션(1차) : 영구 스탠스 확률이 추가 되었습니다. - 윌 오브 소드(2차) : 공격력과 딜레이가 조정되었습니다. - 윙비트(3차) : 공격력이 조정되었고, 4개 이상 소환할 경우 가장 먼저 소환하였던 돌개바람이 사라집니다. 1. 카이저 전용 스토리 퀘스트의 일부가 추가 되었습니다. 메이플 월드맵과 전환할 수 있습니다. 1. 판테온 지역 NPC가 추가되었습니다. 1. 판테온 지역 몬스터가 추가되었습니다. 1. 판테온 지역 일반 아이템이 추가 되었습니다. 2. 판테온 지역 퀘스트 아이템이 추가 되었습니다. 1. 카이저 성장지원 이벤트가 진행 됩니다. - 50레벨 달성! 당신을 위한 특별한 반지! - 70레벨 달성! 당신을 위한 특별한 혜택! - 카이저! 성장한 당신을 위해! - 카이저! 너의 레벨업을 도와줄게! 2. 템페스트 코인 상점 스파크가 카이저 염색 쿠폰을 판매합니다. l 쿠폰은 3차 전직 이상, 파이널 피규레이션 상태의 카이저만 사용 가능합니다. MapleStory Client Ver. 1.1.439 release has been corrected. A. New neighborhood 'pantheon' was held. - Pantheon of the Maple World geurandiseue different from the world of the temple is a village in the Nova family. - When you create the Kaiser will be entering the pantheon. 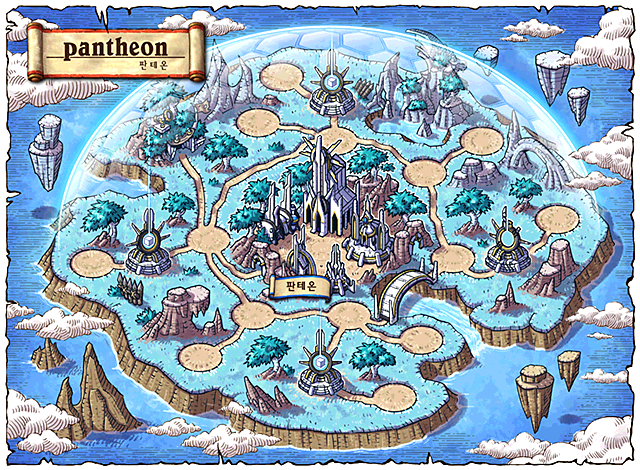 - In the interior of the Pantheon daesinjeon 'dimension gate' through all of the Maple World, you can go to town. - To go to the Pantheon in the Maple World "six roads diverged" added to "gate dimensions' should be used. A. Kaiser's skill has been adjusted as shown below. - Regular use of each attack skills / commands when using the morph gauge the amount has been adjusted to the car. - Trans pigyureyisyeon (Beginners): stance, the probability has been adjusted. - Dragon Slash (1st): Damage has been adjusted. - Skin protection (primary): 09 chance of stance has been added. - Will Of Sword (2nd): damage and delay have been adjusted. - Wingbiteu (3rd): Damage has been adjusted, if four or more summoned dolgaebaramyi who summoned the first disappears. As a springboard to move. A. Kaiser only part of the story quests have been added. - Kaiser, is awakening. 10 or higher. - The fate of the Kaiser, and geurandiseu. 10 or higher. - The ability of the Kaiser. 10 or higher. - Command skill practice. 10 or higher. - Transformation? Failure. 10 or higher. - Where is tier? 10 or higher. - Belderoseuui ridicule. 10 or higher. - Tear up 1. 10 or higher. - Tear up 2. 10 or higher. - Resource Gathering tournament. 10 or higher. - Let's find out what I can do. 10 or higher. Maple World Map and you can switch. A. NPC has been added to the Pantheon area. A. Monster has been added to the Pantheon area. A. Common items have been added to the Pantheon area. Two. Quest item has been added to the Pantheon area. A. Kaiser is in progress, growth, support the event. - Reach level 50! Special ring for you! - Reach level 70! Special benefits for you! - Kaiser! Grown for you! - Kaiser! I'll help you level up! Two. Tempest coin store coupons dyed Kaiser spark sales. more than a third ex-l coupons, Final pigyureyisyeon state kayijeoman available.